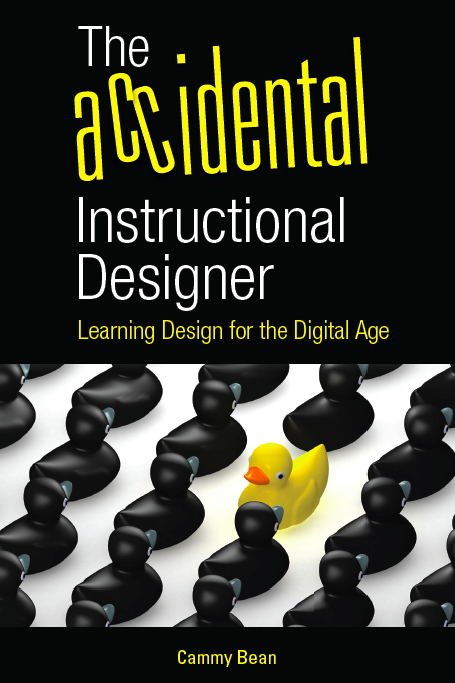 The Accidental Instructional Designer: Now Available for Pre-Order! The Accidental Instructional Designer: Learning Design for the Digital Age is now available for pre-order on Amazon. Hey, guess what? I accidentally wrote a book! The Accidental Instructional Designer: Learning Design for the Digital Age: a thrilling tale of what happened when one young woman (that's me) woke up one day to find that she was an e-learning instructional designer. It's a book packed full of tips and ideas and inspiration for taking your eLearning design practice from an accidental path to one of purpose, passion, and intention. The book is being published by ASTD and final proofs were sent off to the printers last week. Information coming soon on pre-orders from Amazon. Look for hard copies coming in early May. I'll be at ASTD's International Conference and Expo (ICE) May 5-7 where I'll be running a session called The Accidental Instructional Designer, working the Kineo booth on the expo floor, and doing an author chat/book signing session. Hope to see you there! Live in New York it's Kineo Konnect! Join us April 9! There's still time to sign up for our springtime community event in New York City. We'll be taking apart everybody's favorite topic: boring old compliance training. I'm really looking forward to hearing from JC Kinnamon and his thoughts on the reluctant learner. But more than that, I'm looking forward to lively conversation and insights from the more than 50 people who have already signed up to come. If you're in the New York area, this is a must attend event! Get all the details on the event and sign up today.